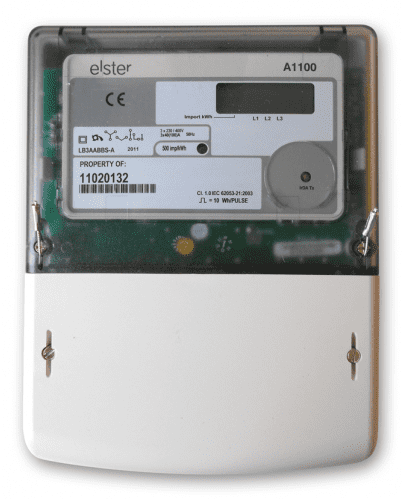 Ofgem Approved Meters It is a legal requirement that you use an Ofgem approved meter if you are going to collect revenue from the meter readings displayed or transmitted to a data collection system. In addition, for electricity supplies to domestic customers by a licensed supplier, an Ofgem approved and certified meter must be used. Certification is a guarantee of each meter's accuracy. The A1100 is an electronic polyphase meter for domestic, commercial and light industrial direct connected or CT connected applications. Two main versions of the A1100 meter are available. The liquid crystal display version of the meter has a choice of display formats and can be supplied with one or two rates. The meter is available as import only or import and export. The display has a customer defined display sequence that can include security information. Chevrons and legends on the nameplate identify the data being displayed. The mechanical register version of the meter is available for kWh import one rate applications only. Five LED's are used to identify the status of the meter/system. The A1100 offers high security with many useful security features. These include phase failure monitoring (A, B and C), reverse run (count, energy reading and alarm), power fail, phase fail and elapsed hours (rate 1, rate 2 and cumulative). These are stored as security data and can be included as part of the display sequence and read via the IrDA or serial data port. Communication is provided via the IrDA (Infrared Data Association) port allowing the meter registers and security data to be read electronically using a hand-held device. This greatly reduces the possibility of manual meter reading errors. The meter can be configured at manufacture to provide the same absolute serial data as the IrDA port via the meter auxiliary terminals or RJ11 socket. As an alternative to the serial data the meter can be provided with a pulse output via the auxiliary terminals. The pulse output is in accordance with SO standard (IEC 62053-31). Automatic Meter Reading (AMR) is facilitated by either the IrDA port, serial data output or the pulsed output. Meters can be supplied to meet accuracy EN 61036 Class 1 or Class 2 requirements or EC Directive 2004/22/EC (MID) - kWh Class A or Class B.